Continuing technical problems have forced rail firm Grand Central to delay a return to full service. The company, which operates between Sunderland and London, was left with only one train and had to introduce a reduced timetable on 21 May. It had hoped to restore the three-times daily service by the start of July. This has now been postponed while the firm carries out further "exhaustive tests" to ensure that passengers face no further disruption. The new daily service, via Teesside and North Yorkshire, began operating on 1 March after being repeatedly delayed by problems obtaining refurbished stock. But since then Grand Central's 125mph trains have been dogged by breakdowns. 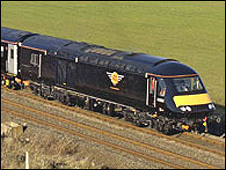 In May, the firm introduced a reduced service with only one train making the daily return trip, leaving passengers to use a shuttle service between Sunderland and York at other times. Four of its six power cars are now fully operational - enough to operate a full timetable - but work is continuing to ensure the company has a robust back-up equipment in case of further problems. A spokesman said: "Grand Central is very reliant on the goodwill of the people of the North East, who will be informed as soon as a full service can be restored."